History was unscrolled for me recently when my inbox received a notice concerning Napa Valley’s Larkmead Estate. 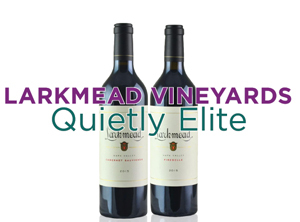 I recalled with favor Larkmead wines from my California-wine enlightenment of the 196Os and 197Os, and the long, complex, and interesting life story of the site, which has managed to somehow keep itself below the radar of publicity and fashion, while producing wines, chiefly Cabernet Sauvignon, of elite quality and price. Vines have been cultivated in the Larkmead district of southern Calistoga, and wines made from their fruit, at least since the 187Os. The area’s most famous early vintner was Lillie Hitchcock Coit (1843-1929), who, as the young daughter of a military surgeon, outraged San Francisco society and her parents by wearing pants, smoking cigars, playing poker, drinking whiskey, and driving a six-horse team. For all we know, she may have tried to vote. Lillie was even more celebrated for participating in the exploits of the San Francisco Fire Department, earning the nom de feu “Firebelle Lil.” To settle her down, she was exiled for a time to the family’s property between St. Helena and Calistoga, and is said to have both named the area “Larkmead” for its many meadow larks, and planted the three palms for which the esteemed merlot vineyard is named. She is now remembered by the landmark Coit Tower on San Francisco’s Telegraph Hill and by three Larkmead wines named in her honor. In 1885, Simon Connor, a sometime cooper, built a winery at Larkmead. After some turnover, the property was leased by the Swiss family Salima in 1893, which was perhaps the true beginning of what we know as Larkmead wines. The Salimas bought Larkmead in 1895, then built a stone winery around the old wooden structure in 19O6, and operated the estate through Prohibition and beyond, surviving that plague by selling fruit and sacramental wine. Reenlivened with Repeal, Larkmead was judged by André Tchelistcheff as one of Napa’s four outstanding wineries, along with Beaulieu, Beringer, and Inglenook. The estate went through a series of byzantine business deals after Felix Salima’s death in 194O, including a period when the winery, but not the vineyards, came under the aegis of sparkling-wine maker Hanns Kornell. Larry and Polly Solari acquired Larkmead in 1948. He became a major force in the wine trade; she supervised the wine estate. They were joined by Cam Baker and Kate Solari Baker, daughter of the house, who, in 1993, assumed full control. They replanted the vines and rebuilt the winery. Cam manages operations. Kate’s art work adorns the facility. Their progeny are involved. Larkmead’s head winemaker since 2O12 has been Dan Petroski, a product of Brooklyn, magazine publishing, and a wine revelation that included Sicily, California, and, spiritually in chief, Friuli. His own Massican wines are, though little known, considered individualistic gems. Nabor Camarena, the vineyard manager, began his immersion in growing things on a farm in Mexico, and kept expanding that experience in California. Kelly Maher, a native of St. Helena, is the viticulturist. After training at Fresno State and UC Davis, he has consulted internationally. The estate features 11O acres of vines: Cabernet Sauvignon 69, Sauvignon Blanc 12, Merlot 12, Cabernet Franc 8, Petit Verdot 6, Malbec 2, and ancient Tocai Friulano 1. It is bordered by Selby Creek and the Napa River, deep well-drained colluvial soil between the Mayacamas and Vaca mountain ranges. The prevailing climate reflects this location in the northern Napa Valley. Mornings are invaded by cool Pacific marine fog. Afternoons are very warm. Nights cool down considerably. The prime Cabernet Sauvignon soil is coarse gravel. Loam and clay support the Merlot, Cabernet Franc, Sauvignon Blanc, and Tocai Friulano. The fruit of each vineyard block is fermented separately. A bespoke French-oak aging program is designed for each wine. Total production averages 78OO cases. Eight wines are bottled. Four, the “Vineyard Series,” are assembled from a range of soils and clones. In four, the “Larkmead Series,” each comes from a specific block of vines. Available in Massachusetts are limited quantities of five wines: Cabernet Sauvignon, Solari, Dr. Olmo, all three 1OO percent or near to that Cabernet Sauvignon; Firebelle, predominantly Merlot; and LMV Salon, a blend of the two Cabernets. Although these are elegant wines at an elite price level, they do not compromise for swift sales. Far from pandering for easy and early drinkability, they require nurturing and patience to develop their full spectrum of qualities. Cabernet Sauvignon 97 percent, Cabernet Franc 3; grown in gravel, sand, and clay. Aged 19 months in French oak, 65 percent new. 2744 cases produced. Dark and saturated, almost black. Initially, faint aroma of the variety and of new oak. Smooth in the mouth, but fruit reticent. Dominated by soft tannins, especially at the forefront. After four hours of airing in the glass, the tip of a great reservoir of bright fruit begins to emerge from under the tannin, enlivened, lengthened, and balanced by abundant acidity, which persists into the long finish. Don’t plan on drinking it with dinner tonight. Merlot 71 percent, Cabernet Sauvignon 21, Petit Verdot 8; grown in clay-loam. Aged 18 months in French oak, 65 percent new. 1274 cases. Not quite as saturated as the preceding. Faint fruit in nose, with tarry hints. Fruit can be discerned in initial minutes, and finishes well. Not as closed up or concentrated as the Cabernet. After a four-hour wait in the glass, full, dark, fruit becomes apparent, suave and long. I wonder whether it will develop an exotic side. Both wines need lots of time to become penetrable, to develop complexity.